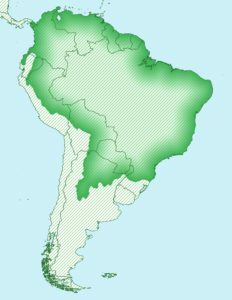 We refer to the greater Amazon region of South America as the “Green Window”. This is the geographic focus of our ministry. Spanning an area larger than the continental United States, the Amazon Basin and its lowland periphery contains half of the world’s remaining tropical forests and one tenth of the world’s animal and plant species. It is also home to between 500 to 700 unique tribal people groups. Some of these tribes are relatively large in population, residing in well-established traditional lands; many others are small bands of nomadic to semi-nomadic groups scattered across some of the most remote and inaccessible corners of the earth. Even today, many of these people groups remain in complete isolation from the outside world, as over 200-300 Amazon tribes have yet to hear the gospel message of Jesus Christ. The lack of information currently available to Christian ministries serving in the Amazon Basin is astounding. In spite of a century of missionary work in this region, basic data about tribal divisions, languages and locations, presence of the gospel and strength of tribal churches are often questionable or unknown. Also lacking is information about critical life and livelihood issues related to community development, human rights, health and overall wellbeing. It is within this unique context of the Great Commission that we serve. As the South America Research Coordinators for a vast network of ministries called the “Amazon and Lowland Tribal Empowerment Coalition” (ALTECO), we are responsible for developing information strategies that shed light on ground realities and real needs. Key to this task is a focus on equipping and empowering others – tribal Christians, national ministries and foreign missionaries across the Amazon Basin – to gather and share accurate and up to date information about each indigenous tribe, language and community.